Department Head of Computer Science and Mathematics, will be presenting. All faculty, staff, and students are welcome! It's an open event - the public is also invited so if you know of someone who would like to attend, please invite them! Depending on reaching critical mass, the seminar will be opened to external researchers. 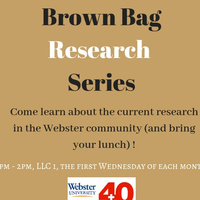 It's brown bag format, so please feel free to bring your lunch to the talks!